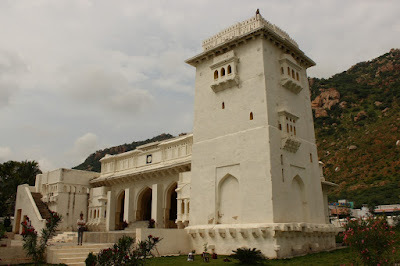 This was the maiden visit to Penukonda fort. For some reason, all the monuments' doors remained closed, I'd to see them from outside. 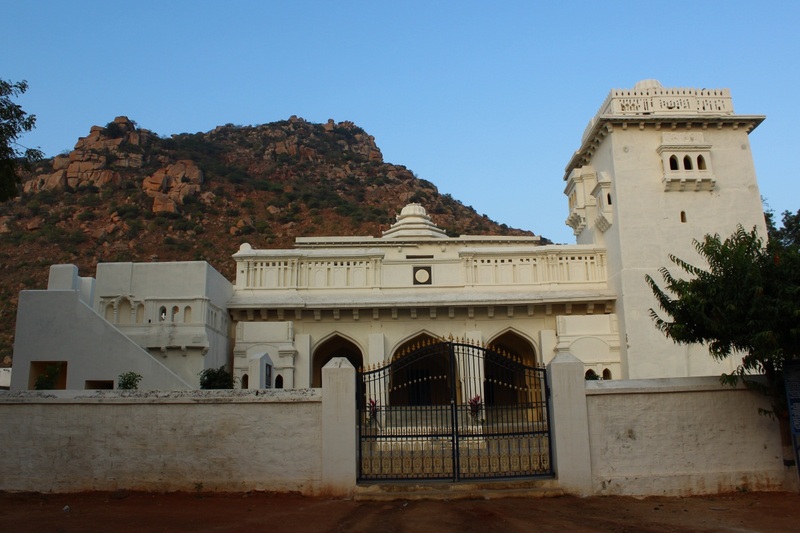 Gagan Mahal's gates were locked and the caretaker was not available even until 9 AM. I gave up.. 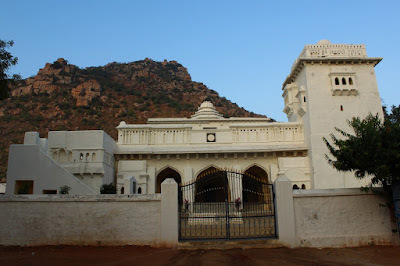 The historical town Penukonda, the Mandal headquarters is located on the Guntakal-Bangalore section of Southern Railway and about 71 kms from Anantapur on Kurnool-Bangalore highway. 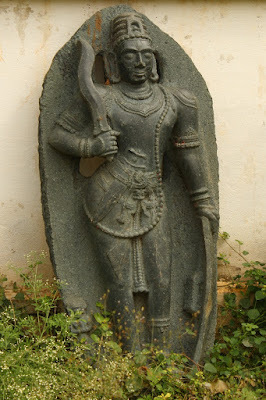 It was once acted as second capital of the glorious Vijayanagara. 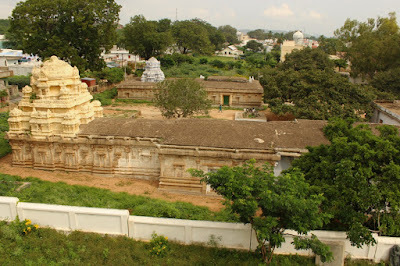 Number of religious in secular structures has been added at this place during the Vijayanagara period. In the residential fort area the temples dedicated to Rama, Siva, Mukteswara, Parswanatha, Narasimha, Venkateswara, Kali, mosques, Thimmarasu Jail, Mathas, watch towers, Vykuntapuram, water tanks and Gagan Mahal are important structures. 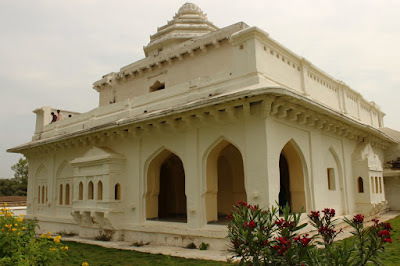 Gagan Mahal is the only structure which is under the control of Department of Archaeology and Museums. An old Hindu palace i.e. Gagan Mahal is located to the south of Ramaswamy and Eshwara temples. It was the summer palace and harem of Vijayanagara rulers. The building is facing east and composes of two stories of arcade chambers, square on plan with corner tower on the northern side. In front of the building there are steps leading into the building also staircases on either sides leads to the first floor. 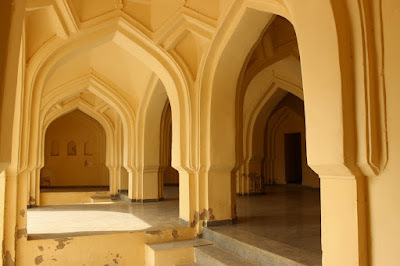 The ground floor consisting with recessed and forty five foliated arches in the pavilion reminiscent of the Lodi type of arches in the buildings of Delhi. The middle of the ground floor and first floor made a provision of rooms. The first floor has twelve arches and eight windows. 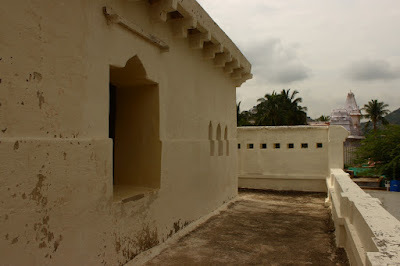 The surface of the walls of building is coated with stucco. The pyramidal roof built-up in tiers is obviously adopted from Sikhara of the Dravidan style. The tower has six projecting windows supported by brackets. It was built by a combination of Indo-Persian architectural style known as Indo-Sarcanic adopted by Vijayanagara kings. The palace was built without a single rafter, a unique specimen architecture. - Archaeology and Museums Department. The second visit turned out lucky, the caretaker was available. It was around 9-15 when we reached the spot. A bus full school children from Dharmavaram reached at the same moment; the group were on a historical tour for the day. 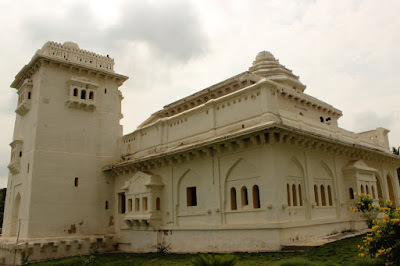 The east-facing palace is situated at the base of Penukonda hill. Steps leading to the fort atop the hill is a short walk from here. Also close by is a pond named Bhoga Samudram, probably a source of fresh water for the palace. The asymmetric design of the structure gives it a unique look. I went around the building starting from front right. The building has two roof tops, one for the main building and the other for the tower. 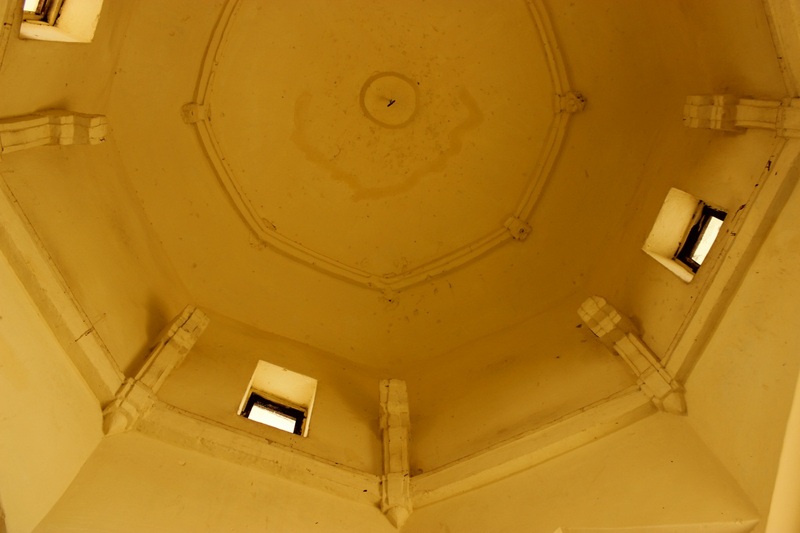 The roofs are capped by a pyramid-shaped Shikhara, same as the Lotus Mahal at Hampi. The palace has windows on all sides.. creates cross-ventilation through out the building. Good number of balconies for residents to relax and enjoy fresh air and beautiful sights.. surely the palace would be surrounded by well kept gardens with colorful flowers. I'm not sure if this was painted in white originally. The rear left corner of the building has three arches.. this is to aide easy air inflow. The air stream will split and flow around the central hall and flow out from the front. So a person entering the building will receive a cool welcome.. aah! A beautiful maiden carrying a tray filled with glasses of cool drinks would be part of the welcome. This is what you see as soon as you step into the building. The original flooring has been replaced with marble tiles.. the interior looks are screwed up. 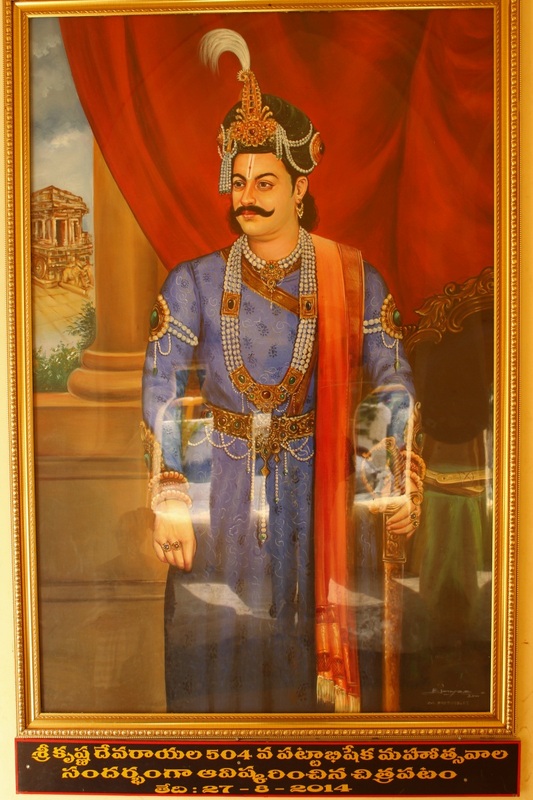 A life-size picture of formally attired Sri Krishnadevaraya adorns the wall next to the tower entrance. I think the original flooring would have been glossy white made of lime mixture which helps maintain the cool ambiance. 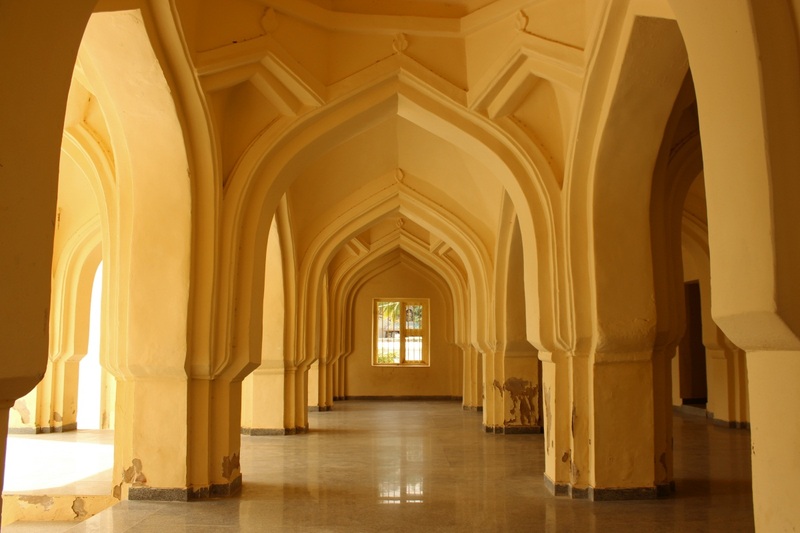 You can see such flooring today at the Jumma Masjid in Gulbarga fort. We climbed to the first floor; this is the open balcony for a view of moonlit and starlit skies. The balcony is all around the first level. The central dome; the high floor to ceiling gap will create a good draft to carry out warm air and bring in cooler air. A large window serves as a seat with a view of Penukonda hill. On the hill would be guards watching the surrounding plains for signs of danger. This video will talk you through the building starting from the tower top,. Yogi Ramaswamy temple and Kashi Vishwanatha temples as seen from the tower. 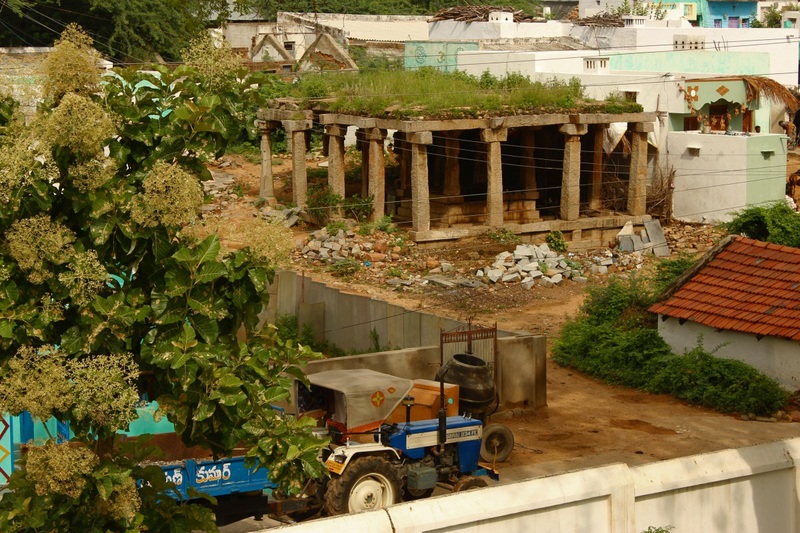 A neglected Mantapa surrounded by houses.. who knows how much of government land has been illegally occupier. Within the palace walls is an open air museum of ancient sculptures, mostly hero-stones. Here are three samples. Group of people worshipping Shiva Linga and Nandi. 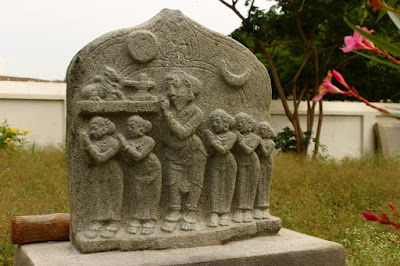 Its customary for a hero-stone to depict Sun and Moon. 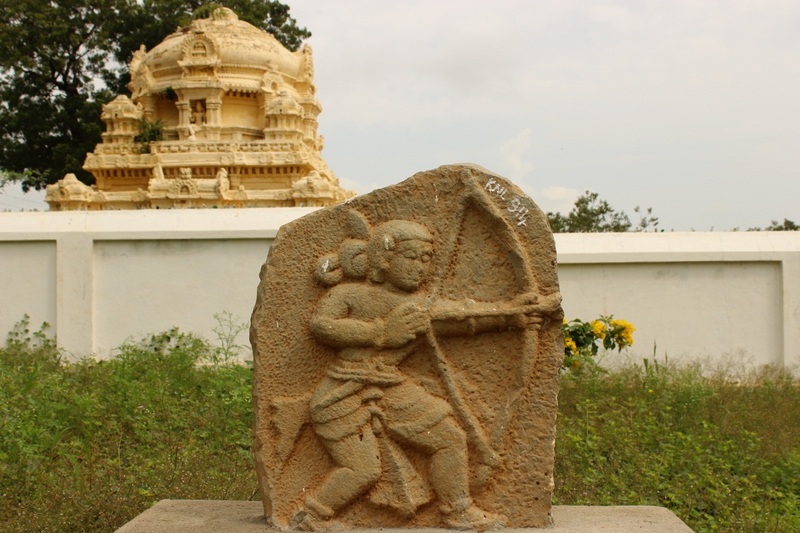 The other hero-stone depicts an archer holding a strung bow, aiming to shoot.. The third sculpture is a black granite job.This male character wielding a wavy blade sword must be a warrior from a royal lineage. 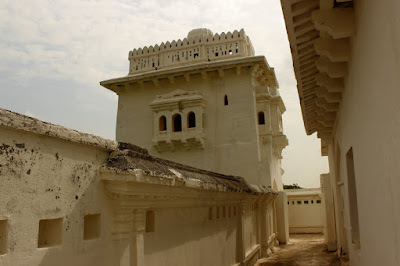 Having done with the summer palace we head towards the northern gateway of Penukonda fort..